Why Set My Home Store? It helps us customize our site specifically for you! 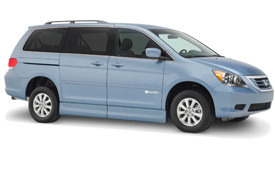 We give you a choice between all the top minivan makers currently available. 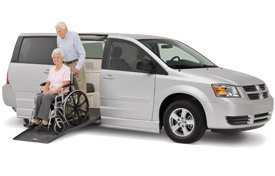 With Honda, Toyota, Dodge and Chrysler rental wheelchair vans available, we are sure to have a van that fits your style. Save on MPG's With This Honda Wheelchair Van! Are looking looking to save money on fuel while renting an accessible van? The Honda will be the perfect vehicle for you as it gets the best MPG's compared to any vehicle in our fleet. Get That Luxury Smooth Ride You Deserve. When people ask us which vehicle is the most comfortable and has the best ride, we don't need to long to think about it. 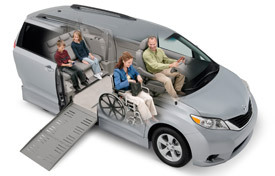 Since the Toyota Sienna first came out as a wheelchair accessible van, it has held the title of best ride. The smooth power and fast ramp and door operation make this a real treat to drive. Are you making a long trip or needing an accessible rental van because your van is broken? 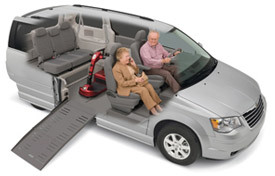 Look no further than the Dodge Grand Caravan with the side entry fold out ramp from BraunAbility. For over a decade, the dodge has proven to be among the most reliable vehicles on the road. Reliable and Ride Quality All In One! The Dodge-Chrysler Entervan has been the star of the BraunAbility model lineup for over 20 years. This wheelchair van conversion is easy to operate and offers a spacious interior. The one touch power entry and exit system includes a power sliding side door, a power ramp, and a power auto-kneel system to reduce ramp angle and make the van easier to enter and exit for wheelchair or scooter users. We're glad to see your interested in renting a van from us. To get things started, simply complete the form below with as much detail as possible. Once we process your rental reservation, we will contact you to confirm your reservation. We will usually get back to you within an hour during business hours.